WHERE WE’VE COME FROM – 2 of Swords (Libra). STALEMATE. I call this the “Scarlett O’Hara card” because, in the movie, when things got tough, she said, “I’ll not think about that now. I’ll think about it tomorrow.” She handles things very well… when she has to, but if she can avoid the unpleasantness, she will at all cost. This card indicates a stalemate in affairs, refusing to decide or act, reaching an impasse. You might be avoiding a person or situation or denying your true feelings about it. A new approach may be needed, emotions are involved causing difficulty with decision-making. Don’t hide from making a decision, pretending it will go away. Take the bull by the horns and make a decision with the best intentions and awareness of consequences. Use logic. There may be a need for greater balance in your intellectual life. WHERE WE ARE -Page of Swords. CHALLENGE. Pages are simple. They simply bring energy or news into our lives. This Page often represents challenging news, delays, bad news, or messages being delivered with a lack of tact. This card also indicates a need to rise above emotional challenges (i.e. talking yourself off the ledge with reason and intellect). You can gain more power through use of intellectual processes, reason, and logic. Be open to the process of reflection and understand that what you are manifesting comes from your decisions, choices and rationalizations. WHERE WE WILL BE – 3 of Coins (Capricorn). PRODUCTION. Teamwork, combining your efforts, cooperation. There could be activities within a group where you are being looked at to help with others because you have proven your abilities. This could also be preparation and planning, organizing and scheduling. You have shown a competence and others know you are up to the task. There is a spoken, or unspoken, commitment and effort with others to create something good; whether in the household, in the physical body, at work, school, etc… This is a time for “fertile integration”; understanding the interconnectedness of all things; the patterns of creation. FOUNDATION – Queen of Cups (Water signs: Pisces, Cancer, Scorpio. Birth dates: June 10 – July 12). Representing a person, she is good-natured, intuitive, imaginative and creative in feeling. She has an instinctual understanding of the maternal. This Queen is attuned to deeper movements of inspiration and emotion. If she manifests her darker side, she can be coquettish, prone to flights of fancy, temperamental or a drama queen. She’s often quite sensitive and, though she can have a keen intelligence, she relies more on her feelings than intellect. If we remove the personage, and look at this card purely as a call to action, she represents the act of caring. It’s time to use emotional and spiritual understanding to your advantage. You should assert your intuition and feeling with control. Trust your gut and attune yourself to the tides of emotional and inspirational energy without drowning in it. 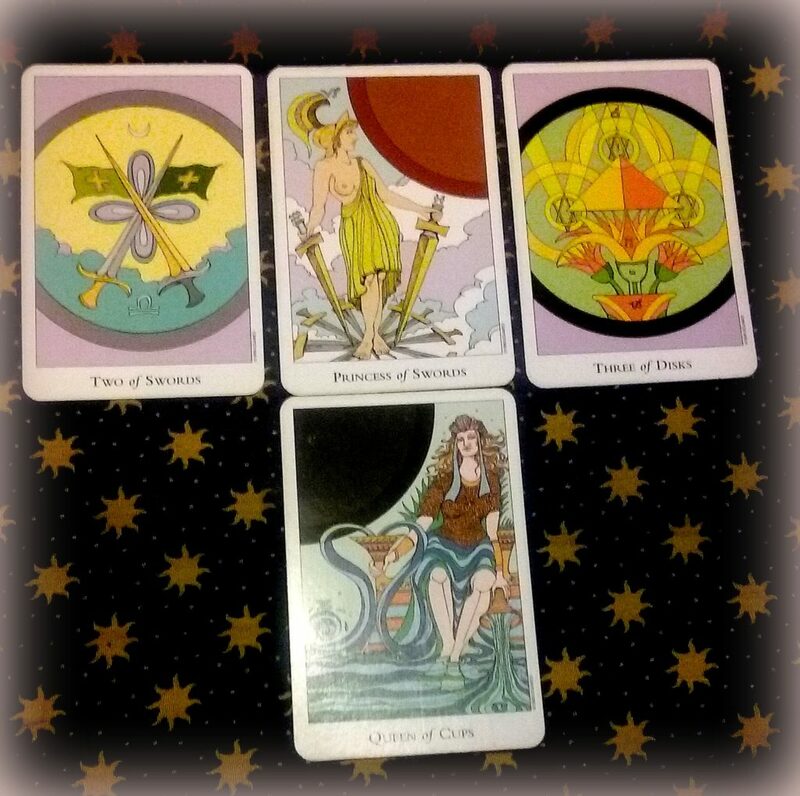 2 of swords, 3 of coins, 3 of pentacles, page of swords, princess of swords, Queen of Cups, weekly reading, weekly tarot. Bookmark.